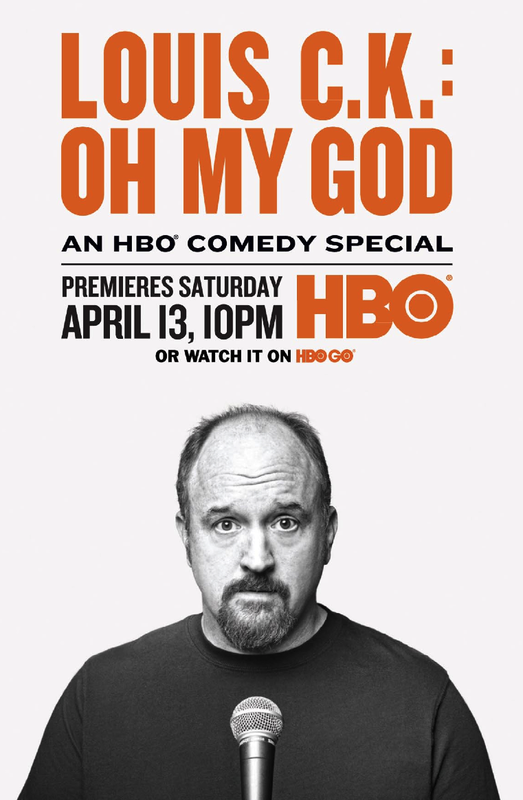 I have no intention of going through and naming each comedy bit, that would ruin the surprise and fun of watching this new hour from Louis C.K.. The core of C.K.’s comedy is not the material itself. He is not reliant on comedy mechanics for laughs. Nothing he says ever feels like a joke in the traditional ‘setup, punchline’ sensibility. No, the humor is sourced in his energy and inflections, where the audience is experiencing the world through his point of view as if we were in his body, thoughts or fantasies. Sometimes it’s all three. Often I find myself laughing at his word choices and visual descriptions. At times, he’s merely just stating the obvious. But the way C.K. utilizes a metaphor or simile is artful in how he can conjoin two separate ideas together, where he can wormhole the audience’s minds to some unexpected grotesque places for comparisons. And then he builds on it by acting out these ridiculous thought trains. There was also one improvisational moment where he accidentally spills water and he comments on it that had me aching in laughter. The bit he did as his closer was truly the climax of this new hour. C.K. makes a point that being older makes a more intelligent and interesting person. He is the living embodiment of his own point. We’re watching a comedian who has grown into himself, and we’re intrigued not just for the laughs, but because he has something to say. A voice with true gravitas that he has earned from living a life. And for that, Louis C.K. seems eternally connected to the grotesque and the morbid, but it’s all enwrapped over a positive message: appreciate life and what you have. That’s how he gets away with saying very horrible things on stage. As an audience member and a student of stand-up comedy, I enjoy watching him get away with it.